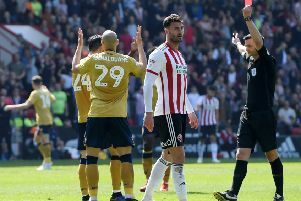 As far as disappointments go, it might not rank alongside bowing-out of the League One play-offs following arguably the most dramatic match in recent memory. But the sight of James Wallace, potentially Sheffield United’s most accomplished midfielder, spending long periods confined to the treatment room has also gnawed away at manager Nigel Clough. Wallace, whose combination of power and poise could be a devastating force in the division next season, missed 50 of the 63 matches United contested in all competitions last term. So it comes as no surprise to learn that ensuring he starts the 2015/16 campaign features highly among Clough’s list of priorities this summer. “James has been as big a miss as anyone,” Clough said. “When we drew-up our list, last summer, no disrespect to anyone else but he was right up there at the top. “He’s been unlucky. Terribly so at times. There’s no doubt about that whatsoever. Wallace, aged 23, progressed through the ranks at Everton before joining Tranmere Rovers on a permanent basis three years ago. Ronnie Moore, his manager at Prenton Park, told The Star that United had acquired a “very special talent” when Wallace moved to South Yorkshire in June. Indeed Moore, now in charge of Hartlepool, described the Liverpudlian as potentially “even better than Kevin (McDonald)”, who left United for Championship club Wolverhampton Wanderers. Wallace has been plagued by a series of unrelated injuries, including knee and groin complaints, since crossing the Pennines but is thought to have made significant strides forward before United’s play-off semi-final against Swindon Town earlier this month. “We’re sure that James will benefit from having a proper pre-season under his belt which is something he’s been denied too often in the past,” Clough said. “He’s been working ever so hard and he can be a huge player for us.